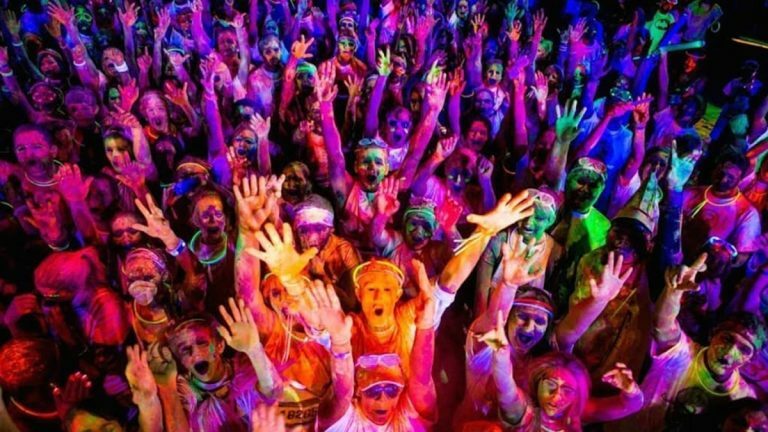 Holi Parties in Delhi NCR ! Holi Celebration in Noida, Gurgaon ! Holi is the most happening festival of India and Delhi NCR is the most happening region in India. So here in NCR many Holi Parties take place during this festive season. Rural Activities: Camel Ride, Camel Cart Ride, Bullock Cart Ride, Tractor Rides, Mehandi, Head Massage. Mud Bath, Tube Well Bath, Charkha, Chakki, Pottery Making, Pottery Painting, Dairy & Farming Activities. Agricultural Activities, Bird and Animal Feeding & many More. Adventure Activities: Commando Crawl, Tarzan Swing, Burma Bridge, Commando Net, Beam Balancing, Cat Walk. Woddy Wave, Double Rope Bridge, Rope Climbing, Rope Ladder, Hopscotch & Many More. Games & Sports: Cricket, Volley Ball, Badminton, Trampoline, Lottoo, Khushti (Wrestling), Kanche (Marbles), Gulel, Dart, Airgun. Archery, Kabaddi, Kite Flying, Tug Of War (Rassa-Kasi), Carrom, Chess, Ludo, Sack Race, Kho-Kho, Matki-Phod & Many More. Instructor Led Activities: Commando Crawl, Tarzan Swing, Burma Bridge, and Commando Net, Beam Balancing. Cat Walk, Woody Wave, Double Rope Bridge, Rope Climbing, Rope Ladder, Hopscotch & Many More. Team Building Activities: Perfect Square, Five Point STAR, Confined Soccer, Magic Mats, Vertical Limits, Scout Clap, Virtual Volley, Tube Potential, Path Finder, Human Ladder & Many More. Snacks (Full Day) – Mix Pakora with Tea, Green Tea, Nimboo Shikanjee, Chaach, Raddish, Carrot, Sugarcane Sakergandi (Boiled), Rabdi Jalebi, Pop Corns & Namkeen Matar. Special Food (Full Day) “On Mitti Ki Choolah” – Missi Roti, Makai Roti & Bajre Ki Roti with White Makhan / Desi Ghee, Gud, Boora, Shakkar, Lahsoon Ki Chutney. Pudina Chutney Kadhi /Sarso Ka Saag, Gulgule, Choorma, Bajre Ki Khichdi, Bajre Ki Roti. Breakfast (9AM – 11AM) – Aloo Sabji, Petha Sabji, Garma Garam Poori, Stuffed Parantha with Curd & White Makkhan, Pickle, Tea & Green Tea, Lahsoon Ki Chutney. Pudina Chutney, Halwa / Kesar Kheer, Noodles, Manchurian & Honey Chilly Potatoes. Lunch (1PM – 3PM) – Shahi Paneer / Kadhai Paneer, Rajma / Chole, Dal Makhni / Dal Tadka, Veg. Raita / Boondi Raita, Seasonal Veg. / Mix. Veg. Dum Aloo / Jeera Aloo, Matar Mushroom, Kadhi Pakora, Jeera Rice / Matar Pulao, Tandoori Roti, Tandoori Butter Roti, Naan, Rasgulla / Gulab Jamun. Lahsoon Ki Chutney, Pudina Chutney, Salad, Papad, Pickle & Noodles. A completely organic Holi experience at Surajgarh Surajgarh Gurgaon - village in city. A Holi celebration with the primary focus on the safety of the customers. A stellar line-up of musical artists. Folk performances by nagada and dhol players. Unlimited organic colours and water guns. Get set to show your Bollywood moves with JassManak of 'Prada' & 'Suit' Punjabi fame, Guri of 'Nira Ishq' & 'Billian Billian' fame and the next big thing Karan Randhawa. Dance to the beats of 6 of the best DJs in town along with live Dhol featuring Mika’s own Dhol group, 'Fashion Dhol'. Taste some of the best food in town from outlets like Soho & Limitless. Colour up your dear ones with some of the best quality organic colours in some of the most innovative tools to splash them. When & Where- Thursday, 21st March at 11 AM ,Multiple Venues- TFR ViLLa, Sector - 34, Near Subhash Chowk, Gurugram & The Friends' Republic, , Dlf Phase 5,Opp Paras Hospital, Golf Course Road , Gurugram. Unlimited delectable snacks (both vegetarian and non-vegetarian) to munch on. 2 energy drinks i.e. beers. Cold, refreshing beers. We will maintain a stock for you guys to buy more beer at the venue. Bhang Thandai and Gujiyas just to amp up that Holi feeling. One round of PUBG Water balloon fight with your squad. Picture stations with some quirky PUBG x Holi themed props. Organic gulal so that there are no skin booboos. A very talented professional photographer who will mint Instagram DPs by the minute. Inflatable pools within the gameplay arena to cool off any tensions between squads. Live music to get those booties moving. Dancing area, because Holi with Adventures on Crack! 2+2 Snacks unlimited for 90 min. Evening tea coffee with pakore. Activities – Obstacle Course – consisting of Flying fox, Burma Bridge, Commando Net, Zip line, Suspension Bridge, Valley Crossing, Tyre Climbing and Balance Walk. Team building Game:Tug of War, Tambola, Pass the Ring, Musical Chair, Pass the ball, Missing Chair, Jik Jak. Outdoor games like Cricket, Football, Basket Ball, Volley Ball & Badminton. Ethnic game like Archery, Pithoo etc. Hi Fi DJ with Floor. Camel ride/tractor ride on top of hills.